Fernando Alonso says that his performance at the Azerbaijan Grand Prix was unrepeatable. The Spaniard's race looked to be all but over after the first lap, when he was involved in an incident with Nico Hulkenberg and Sergey Sirotkin. The Spaniard suffered two punctures and had to crawl back to the pitlane, scrapping the pit wall on his way back. However, as the race unfolded, the double-world champion climbed into seventh place, collecting another six points for himself. 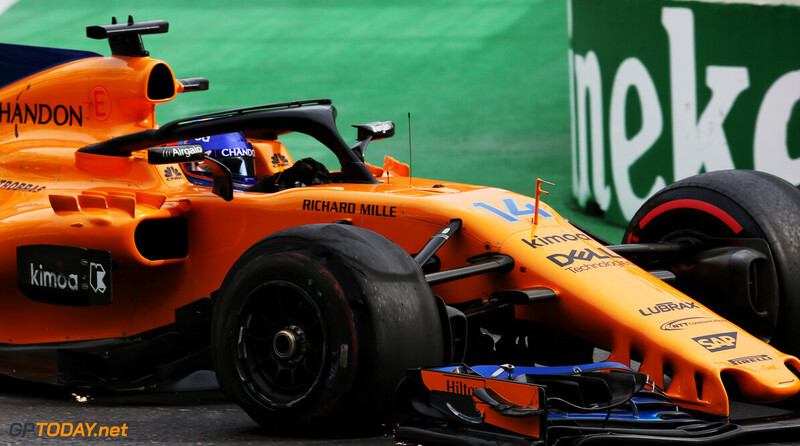 "Another seventh place but I think it was the result of persistence and pride, because I think no one [else] would have reached the pitlane, first of all," Alonso said. "They would have parked the car and if they could reach the pitlane they would have retired the car. But we didn't park or retire the car and fought for every tenth, every lap, close to the walls all race long and, I think it was the best race of my life." Alonso stated that he didn't believe he would be able to finish the race, and was astonished by the amount of damage the car sustained on the first lap: "I reached the pitlane thanks to a miracle. I didn't have two wheels or front wing or floor or anything. "They changed the tyres and they told me the car was heavily damaged so I thought I wouldn't be able to finish or that I would be very slow. But I started overtaking cars and then with the safety car I gained some positions in the end. I've seen the photos of the car damage yesterday. Now I have no doubt, it was an unrepeatable race." Is this Alonso advertising himself to other teams in a not so subtle fashion? He has been doing these kinds of talks since 2017, and while I could agree with some of those sentiments, its getting kinda tedious when he says it every other race. Im glad he is impressed by his own performance, mind, and he is doing a good job for sure. But to me, this sounds like a mating call. A Lyre Bird imitating some chainsaws and a toy gun to attract a female Mercedes, Ferrari or Renault. I agree about the purpose of bringing that up. But at the same time I also think that (1) Alonso has been driving at a consistently high level for several years. I think he's driving better than ever in his career, (2) I understand why he keep making comments like this... I a sport that rewards winners, it's easy to become forgotten and irrelevant when driving the awful McLaren cars of the last few years. I suppose it's a way to keep people paying attention. Of course, I say all of this as a massive Alonso fan. He has for sure, you wont hear me say otherwise, but IMO there really is no need for it. Its very apparent how well he does in his situation. This is probably also him putting pressure on McLaren to git gud, but Im not seeing that happening. As I've said before, McLaren is no Red Bull, and even their better chassis tend to be less versatile, and I just dont see them as being as able with that unit as RB is, or works Renault for that matter. If he remains in F1, he is probably looking for an upgrade. I think to be fair to Alonso, how many other drivers have we seen get back to the pits on 2 wheels. He wasnt going to give in. with the musical drive line up next year, Riccy to the reds, carlos to red bull and norris in with Vandorme. If Mad Max had not taken out 3 of the leading cars, DR, himself, and Bottas he would have been 10th. Mad Max must be Alonso's hero. Now I was critical of Max' swerving, but he was literally not responsible for Bottas' puncture. The debris did likely come from that incident, yeah, but its not like he force pushed the debris into Bottas' tyre. Darth Vader he is not. I can't remember who said it afterwards but there were no more debris left on the track after the safety car, apparently it came off from one car or the other after the restart. Which is entirely possible, there was a lot of carnage on a lot of laps. Yeah it coulda come from anywhere. Wasnt exactly a calm race. The debris that took out Bottas came from the Gasly-Magnussen incident. All other drivers would have parked a car that was perfectly driveable? Hmm..
Wonder how Vandoorne feels about these comments. Alonso drives a car that was totaled and in reality couldn't be driven at all, yet he still beat his teammate. We dont know how undriveable it was mind, but this certainly doesnt help Vandoorne's case. Of course. My point was that he's not exactly being a very good teammate the way he's constantly pumping his own tyres in every interview he can find. True, but Alo isnt exactly famous for being a good team mate. Mind, I dont think McLaren in general is a good place for any newbie, far too much pressure.